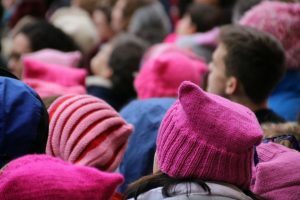 MAYS LANDING, N.J. — A New Jersey politician who shared a meme on Facebook during January’s Women’s March in Washington asking whether the protest would be “over in time for them to cook dinner” is eating his words. Democrat Ashley Bennett, a first-time candidate who was angered by Republican John Carman’s remarks, defeated him Tuesday as he tried to win a second term as an Atlantic County freeholder. The board oversees government in Atlantic County, a region of about 275,000 people that includes the struggling Atlantic City seaside gambling resort. Bennett was not immediately available for comment Wednesday. But before the election, Bennett talked about how the meme spurred her candidacy. “I was angry about (the Facebook meme), because elected officials shouldn’t be on social media mocking and belittling people who are expressing their concerns about their community and the nation,” said the 32-year-old Bennett, an Egg Harbor Township resident who works as a psychiatric emergency screener in the crisis department at Cape Regional Hospital. Bennett plans to focus on economic development issues, noting the need to help lower- and fixed-income residents who may be struggling to keep their homes and the thousands of people left unemployed as some Atlantic City casinos closed. Carman said the meme was “a bad choice,” but that the women in his life were “strong and confident” enough to not be offended by his joke. He apologized a few days later, saying it was an error in judgment. Carman drew more attention last month for wearing a motorcycle jacket with a patch containing a Confederate flag. He said the patch had been on the jacket for years and didn’t have racial overtones. The 58-year-old Carman apologized to anyone who felt offended.